The P.O.W.E.R. Learning Framework P.O.W.E.R. is a method for accomplishing any task based on five basic steps. Prepare. Organize. Work. Evaluate. Rethink. 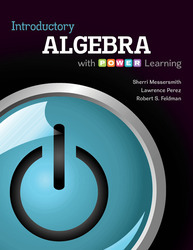 It is integrated at the section level in the Messersmith paperback series to guide students through learning math concepts. The P.O.W.E.R. framework was developed by Dr. Robert Feldman and integrated into his first year experience/student success books, POWER Learning: Strategies for Success in College and Life and POWER Learning and Your Life: Essentials of Student Success. The framework has also been integrated into Dr. Feldman’s Psychology and Your Life text and is the basis for the student success program at UMass at Amherst where he is Dean. Worksheets for EVERY Section of the Textbook Worksheets fall into three categories: review worksheets/basic skills, worksheets that teach new content, and worksheets to reinforce/pull together different concepts. These worksheets are a great way to both enhance instruction and to give students more tools to be successful in studying a given topic. They are ready-made materials for instructors! Perfect for adjuncts! Especially those who teach at more than one school and don’t have time to create tools for their classes. The worksheets help to standardize the level at which the course is taught. To help adjuncts keep pace with full-time instructors. *Available in Connect hosted by ALEKS and ALEKS. Guided Student NotesThis is a silver bullet for the Messersmith series and the supplement has been enhanced and “powerized” for the softcover books. The GSNs are an amazing resource for instructors to help their students become better note-takers. They are a note-taking template containing in-class examples provided in the margin of the text along with additional examples not found in the book. Result #1? Students spend less time copying down information and more time engaging within the classroom. Result #2? Students notes are more organized and more easily accessible and understandable when studying for an exam or going back over homework. Fun with technology! Students with iPads or other tablets can download the Guided Student Notes through the Evernote app and keep them organized digitally. Available in Connect Math hosted by ALEKS and ALEKS. Check out the new Lecture Videos for even more Guided Student Notes resources. Chapter-Opening Vignettes Each chapter opens with a real-world vignette to capture the student’s attention and engage them in the upcoming material. The openers all center around different careers where understanding math is an asset. The openers also introduce the Study Strategy for that chapter. Study Strategy Continuing the integration of student success within the text, each chapter has a Study Strategy theme that is presented in the opening material. Themes are diverse and cover areas such as time management, strategies for taking a math test, vetting and using online resources, speaking in public and more. Putting It All Together •	Most chapters contain a Putting It All Together section. In keeping with the author’s philosophy of breaking sections into manageable chunks, Messersmith includes this section where applicable to help the student synthesize key topics before moving onto the rest of the chapter. Unlike the competition, this Putting It All Together section is not only an exercise set but also an explanation of how to distinguish between different types of problems, and therefore it tries to get students to think through solving problems as an instructor would. This is a good example of where Messersmith helps students learn how to have an internal conversation by teaching them to ask themselves the questions that instructors ask themselves. Group Activities Group Activities are available for each chapter. These will be found either in the end of chapter material or online through Connect Math Hosted by ALEKS. Sherri Messersmith has been teaching at College of DuPage in Glen Ellyn, Illinois, since 1994. She has over 25 years of experience teaching many different courses from developmental mathematics through calculus. She earned a bachelor of science degree in the teaching of mathematics at the University of Illinois at Urbana-Champaign and went on to teach at the high level for two years. Sherri returned to UIUC and earned a master of science in applied mathematics and stayed on at the university to teach and coordinate large sections of undergraduate math courses. Sherri has authored several textbook, and she has also appeared in videos accompanying several McGraw-Hill texts. Sherri lives outside of Chicago with her husband, Phil, and their daughters, Alex and Cailen. In her precious free time, she likes to read, play the guitar, and travel -- the manuscripts for this and her previous books have accompanied her from Spain to Greece and many points in between. That experience, along with his encounters with many students during his own teaching career, led to a life-long interest in helping students navigate the critical transition that they face at the start of their own college careers. Professor Feldman, who went on to receive a doctorate in psychology from the University of Wisconsin–Madison, is now Deputy Chancellor and Professor of Psychological and Brain Sciences at the University of Massachusetts Amherst. He is founding director of POWER Up for Student Success, the first-year experience course for incoming students. Professor Feldman’s proudest professional accomplishment is winning the College Outstanding Teaching Award at UMass. He also has been named a Hewlett Teaching Fellow and was Senior Online Instruction Fellow. He has taught courses at Mount Holyoke College, Wesleyan University, and Virginia Commonwealth University. Professor Feldman is a Fellow of the American Psychological Association, the Association for Psychological Science, and the American Association for the Advancement of Science. He is a winner of a Fulbright Senior Research Scholar and Lecturer award and has written over 200 scientific articles, book chapters, and books. His books, some of which have been translated into Spanish, French, Portuguese, Dutch, Japanese, and Chinese, include Improving the First Year of College: Research and Practice; Understanding Psychology, 12/e; and Development Across the Life Span, 7/e. His research interests encompass the study of honesty and truthfulness in everyday life, development of nonverbal behavior in children, and the social psychology of education. His research has been supported by grants from the National Institute of Mental Health and the National Institute on Disabilities and Rehabilitation Research. With the last of his three children completing college, Professor Feldman occupies his spare time with pretty decent cooking and earnest, but admittedly unpolished, piano playing. He also loves to travel. He lives with his wife, who is an educational psychologist, in a home overlooking the Holyoke mountain range in western Massachusetts.